(ATLANTA) - December 7, 2016 - Last week, the Black Women Film Network (BWFN) hosted their annual Holiday Party at STK Atlanta to announce the honorees who will be celebrated at the 2017 Untold Stories Awards Luncheon in March during the organization's 20th Anniversary year. A number of VIPs were on hand to mix and mingle with the intimate group of actors, screenwriters and producers, including former BWFN honoree Terri J. Vaughn ("Greenleaf"), April Parker Jones ("If Loving You Is Wrong"), Thomas Wesley Dortch, III (Reveal Magazine), Sean Foote (Morgan Stanley), celeb stylist Gocha Hawkins ("L.A. Hair"), DJ Fadelf (author/DJ), DJ A-One ("Kandi Koated Nights"), Dr. Doris Derby (philanthropist), actor Dennis L.A. White (Notorious ) and BWFN Board Members Sheryl Gripper (founder, BWFN), Saptosa Foster (chair-elect), Evelyn Mims, Tomika DePriest, Larry Cooper, Donna Lowry and Susan Ross . Actress Jasmine Burke ("Saints & Sinners") was the emcee for the night. After a brief welcome, Jasmine turned the program over to BWFN founder Sheryl Gripper, who encouraged guests to donate to the BWFN scholarship fund at www.gagivesday.org. 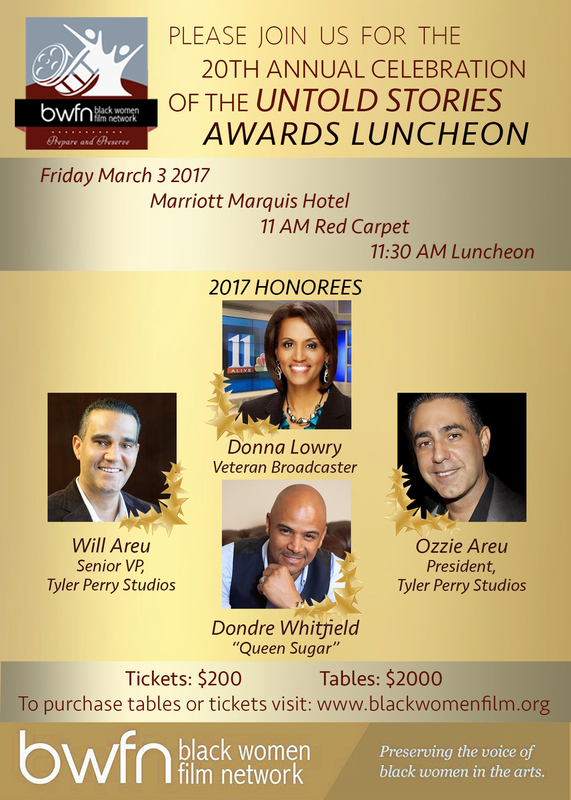 Chair-elect Saptosa Foster announced the 2017 Untold Stories Honorees: Tyler Perry Studios' Ozzie Areu (President) and Will Areu (Senior VP), actor Dondre Whitfield ("Queen Sugar") and veteran 11Alive news reporter and long-time BWFN board member Donna Lowry. The evening closed with acknowledgements by Tomika DePriest and a fun Mannequin Challenge to promote the organization's fundraising goals. For more information on the Black Women Film Network and the upcoming 2017 Summit, visit www.blackwomenfilm.org. Follow #BWFN on social media: Twitter (@BWFN), Instagram (@BlackWomenFilm) and Facebook.com/TheBWFN. Established in 1997, the Black Women Film Network (BWFN) was founded to prepare black women to enter the film and television industries. © 2019 Black Women Film Network (BWFN). All Rights Reserved.